Toronto O-Ring Products | O-Rings | Global Rubber Products Ltd.
O-Rings are some of the most common seals used in today’s modern machine designs. Beyond their impressive performance specs, O-Rings are cost-effective and easy to use. With advanced polymers, our stock and custom O-Rings can withstand tens of megapascals of pressure—that’s thousands of pounds per square inch! O-Rings can be manufactured in a variety of compounds in both imperial and metric sizes. Even the standard imperial-sized AS 568 (Aerospace Standard) comes in over 360 different sizes of cross section (C/S) and inside diameter (I.D.). We also have quad rings and square rings available. Metric sizes are available in over 4000 different sizes depending on where they are being produced. In Germany, Sweden, France, Britain, Italy, and Japan, standard dimensions are slightly different from one another. When there is no standard size to suit your requirements, custom options are available. Our custom vulcanized endless O-Rings come in imperial (inch) sizes, from 1/16” to 1”, as well as metric sizes from 1.6mm through 25mm and above. 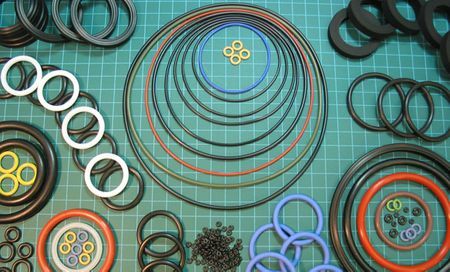 Custom vulcanized O-Rings are available in round or square rubber cord varieties. Compounds include: Buna’n, EPDM, Silicone, Neoprene®, Aflas®, Isoprene and Fluoroelastomer in black, green, brown, red, blue, and white. For additional ordering information, please view our product catalogue, or contact Global Rubber Products today to speak with a sales associate.